This week, we would like to highlight our furry friend the three-toed sloth, which is the world’s slowest mammal. This lazy lounger lives such a sedentary life hanging from the treetops that algae will grow on its furry coat. Not only does this green growth serve as camouflage for the critter, but it also serves as a home for moths, beetles, cockroaches and fungi. The three-toed sloth is arboreal, or “tree-dwelling”, spending the majority of its life hanging from tree branches. These critters even sleep while hanging, as much as 15-20 hours a day! This is why sloths will even mate and give birth in the tree tops. 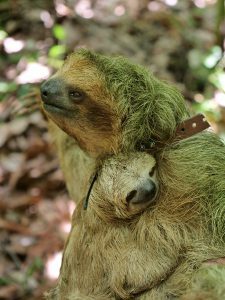 When sloths are first born, they will often travel by hanging onto mothers for the first nine months of their lives. Once babies have been weaned, mothers will leave their home territory to their offspring and move elsewhere. Even if you haven’t been afforded the chance to see this unique mammal in person, most are familiar with the peculiar look of the three-toed sloth’s large curved claws. These claws are part of what allows the sloths to hang from tree branches for extended periods of time, although these appendages become very cumbersome on land. With its weak back legs and gangly claws, the adult three-toed sloth cannot crawl on all four legs on land, and therefore will traverse the ground by pulling itself forward with its long front legs. The three-toed sloth is but one of the creatures that we work to protect and provide habitats for in our farm regions. In addition to maintaining forest reserve, over 40 hectares of native fruit trees have been planted to provide food for animals found in the region. This is but one way that Chestnut Hill Farms works to implement sustainable farming practices to protect our environment and its wildlife. Read more about our sustainable farming practices. This entry was posted in Featured, Latest News, Tips & Tall Tales and tagged conservation, farm, pineapple, sloth, wildlife. Bookmark the permalink.